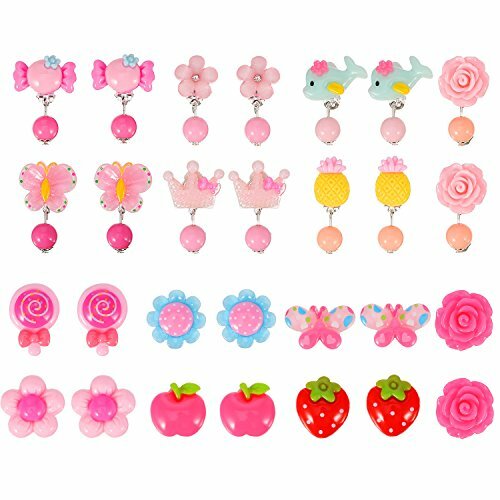 Come with 14 pairs of clip-on earrings with different styles, there are all in 2 clear plastic box; Variety colors and styles make you feel like a princess. Safe and easy clip-on design comfortably fits your ears, no piercing required. with white earring pad, comfortable and easy for wear, protect your ears from pain. Cute and fashionable earrings are good gift for girls on birthday, anniversary, Christmas, Halloween, Thanksgiving day, etc. ; Lovely sweet design styles suit for all kinds of occasions. This item has a small white earring pad that removable, be careful to save to avoid loss; Small part, do not let the child contact, to avoid swallowing. Suitable for all kinds of occasions: good accessories for dressing up for birthday parties and other occasions; Also a great gift for girls on birthday, anniversary, Christmas, Halloween, Thanksgiving day, etc.